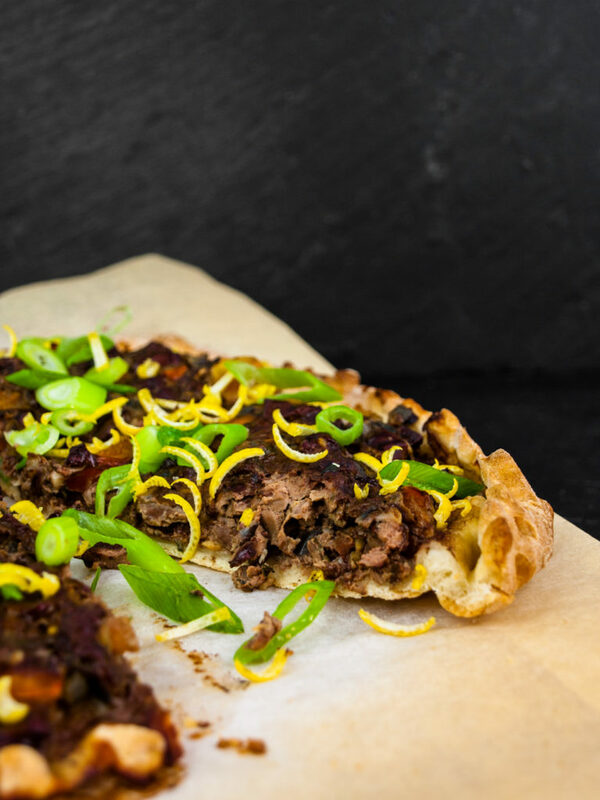 A French twist on pizza with chicken liver, ground beef and a lot of flavor! Pizza Lyonnaise is a delicious twist on pizza that makes offal a bit more suitable for the mainstream. If you like the taste of liver sausage you for sure will love this pizza! The ground beef and tomatoes in the pizza topping balance out the somewhat harsh taste of the livers. All the herbs and aromatics make the pizza a tasty treat that even people that usually are not too keen on liver will like. Thyme, rosemary, onions, capers and lemon zest transform this French twist on pizza into something truly amazing. For most people meat revolves all around the fillets, steaks or other more premium cuts. An animal however also has a lot of other pieces of meat and especially organ meat is often a no-go area for a lot of people. I truly believe we should all eat more offal cuts of animals again and there are two main reasons for that. One the one hand, these cuts have a lot more flavor. Especially when it comes to chicken, breast fillet can be dry and a bit boring at times. On the other hand, I think we owe it to the animal that we use all parts – from head to toe. If we slaughter an animal we should also be willing to eat all the parts they provide for us. Organ meat is full of nutrients while being very inexpensive. Your grandparents loved these offal cuts and so should our culinary generation. For this pizza I usually not only use chicken liver but -heart as well. To me personally, these two pieces of the animals are totally underrated by most people. They are cheap but add so much more flavor than the boring old chicken breast or thigh. You want all the ingredients to be chopped up finely and be well incorporated into each other. One trick, which I saw in a (unrelated) recipe from Jamie Oliver, is to start with chopping up your aromatics and then chop your meats on top of them. Finely chop the herbs and capers first, then dice the onions and garlic, placing them on top. Put the liver pieces on top of the onions and start chopping. As you are chopping the meat on the bed of aromatics you truly incorporate all the flavors into the meat already. Just keep chopping back and forth until you have the meat consistency you like. Use the lemon zest only after baking to prevent it from burning and to have a fresh delicious zingy flavor contrast to the deep flavor of the meats. Give this unusual twist on pizza a try, even if you are not too keen on offal cuts in general. You won at be disappointed. I was able to convince everyone that tried it! A delicious little twist on pizza with chopped chicken liver and a lot of aromatic herbs and spices! Prepare the pizza dough according to the instructions and let it rise. While the dough rises, chop up your topping. Pluck the leaves and needles from the thyme and rosemary sprigs. Discard the sprigs themselves. Finely chop up the thyme, rosemary and capers using a big kitchen knife. Finely dice the onions and garlic. Layer the chicken liver on top of the aromatics and chop until fine and well combined with the other ingredients. Scrape from your cutting board and place in a bowl. Add the minced beef. Finely dice the tomatoes and add them to the meat. Add the olive oil and 1 teaspoon of each salt and black pepper. It sounds like a lot but trust, me you need this. Mix until everything is well combined. Roll out the dough and make an awesome delicious pizza! Preheat the oven to 220°c (fan works best for a crunchy pizza crust). Roll out the dough with a rolling pin (or a wine bottle). The dough should be around half a centimeter thin. If the dough sticks, turn it over to take in some more flour from your kitchen counter. Line a baking tray with parchment paper, transfer the dough onto it and stretch in shape. Place the meat mixture on top and spread out evenly with the back of a spoon. Bake the pizza in the oven for about 20 minutes until nicely browned all over. Sprinkle grated lemon zest, parsley or spring onions over your pizza, slice it up and dig in! Did you ever try pizza like this before? What do you think of offal cuts of animals, do you like or hate them? Place your suggestions in the comments below and let’s try to make this recipe even better!